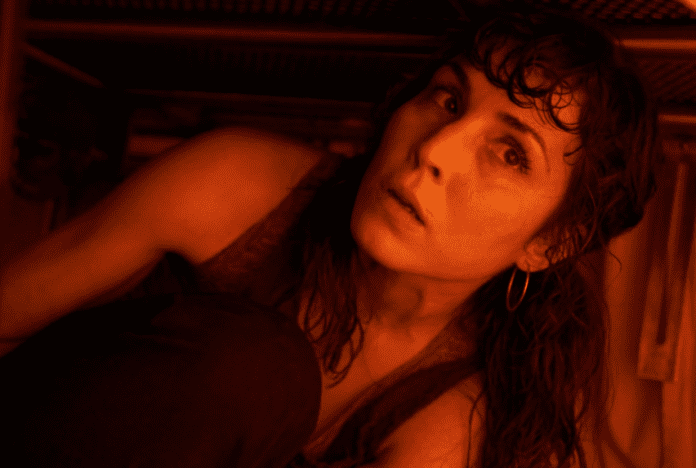 Renee (Noomi Rapace) was leading an unremarkable existence in suburban Kansas City the day she was abducted by five strangers after her car broke down. Until then, she was just an average divorcee’ doing her best to shield a young son (Percy Hynes White) from an embittered ex-husband’s (Paul Popowich) vicious barbs. Otherwise, her routine was so drab, between work and helping Evan with his homework, that she decided to add a little spice to her life via skydiving. Then, hours before she got a chance to jump out of a plane as planned, she’s kidnapped by the aforementioned quintet with an unspoken agenda. Soon, Renee’s chained down in a cell where she finds herself being interrogated by jailers who obviously already know a lot about her, like the fact that she has a son and a terrible fear of spiders. However, they refuse to reveal why she’s been taken hostage. Luckily, the fellow in the very next cell (Jonathan Potts) is willing to share what little he knows, once their torturers are out of earshot. He whispers that there are about 20 other inmates and he also cryptically makes reference to “G-10-12-X,” whatever that means. Getting there is all the fun in this paint-by-numbers affair which has the ingenious heroine resorting to one of the oldest cinematic cliches by escaping via the ventilation system. Just don’t let anyone spoil the conclusion, or you’ll have no reason to check out this hackneyed horror yarn co-starring Peter Stormare, Kerry Bishe’ and Michael Chiklis.